Happy Memorial Day to Swarovski Crystal Fanatics! Memorial Day, formerly known as Decoration Day, is a USA holiday celebrated on the last Monday of May. It commemorates our military personnel who died in service. On this holiday, Americans proudly display their USA flags and spend time with families. Swarovski Gear Pin (Left), retails for $65 and Swarovski Gear Heart Pin (Right), retails for $65. Both Swarovski pins and other new release Swarovski crystal figurines can be found on the Crystal Fox Gallery web site, and appear to be in stock. Of course you can’t have it to wear today, but you can be ready for July 4th if you order now! Swarovski introduced the Swarovski Lovlots figurines in 2006. The Swarovski Lovlots were not just crystal figurines….they were animal caricatures vibrant in color, each with a personality of its own. The initial group of Swarovski Lovlots is known as the Swarovski Lovlots Pioneers. There were 8 animals in the Lovlots Pioneers. These Swarovski crystal figurines were all clear in color. In 2008, the next group launch of Swarovski Lovlots was the Swarovski Gang of Dogs. The Gang of Dogs consisted of 4 dogs, plus a Swarovski Limited Edition Dog (Violetta) that was only available in 2008. Find out more in our Kristall Buzz News with Gang of Dogs Video. In 2009, the Swarovski House of Cats group was introduced. The House of Cats was comprised of 5 cats, a cat pair, and a Swarovski Limited Edition Cat (Theo) that was only available in 2009. More information is available in our Kristall Buzz News with House of Cats Video. In 2010, the Swarovski City Park group was released. The Swarovski City Park included 8 critters that may be found in the park, a bird pair, and a Swarovski Limited Edition Woodpecker (Ziggy) that was only available in 2010. See our Kristall Buzz News with City Park Video for more about this series. In 2011, the Swarovski Circus group was announced. The Swarovski Circus encompasses many favorites found at a circus….6 animals, a 7th animal that is available for a limited time only, and a Swarovski Limited Edition Horse (Jade) that is only to be available in 2011. See our Kristall Buzz News on the Swarovski Circus about the official launch. Now, after the short background introduction, you will be pleased to know that there is a web site with the Swarovski Lovlots Retirements in a free and easy-to-use format. RetiredSwarovski.com has a series of web pages with Swarovski Lovlots Retirements, 2006 through 2011. If you want to know what year a Swarovski Lovlots figurine retired, type it in the ‘search’ box of the site, and the results list will indicate a list of possibilities for a collector to select from to make getting the retirement year (answer) successful. At RetiredSwarovski.com, it is also possible to print out the fact sheet listings by year of Swarovski Lovlots retirements, 2006 to 2011. The fact sheets are very useful in knowing which figurines retired in which years. The fact sheets include small photos, official Swarovski Product Name, Swarovski Part Number, Swarovski System Number, Swarovski Designer, Year Introduced, and Year Retired. 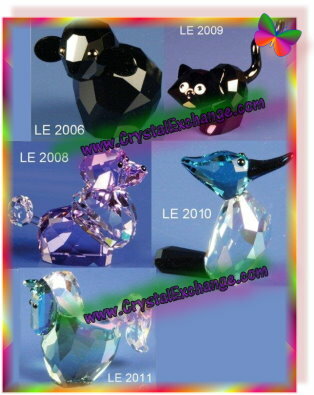 Crystal Exchange America has a selection of Retired Swarovski Lovlots figurines in their online store. If there is a Swarovski Lovlots crystal figurine absent from your display, visit the web site now, or if it is something that they can locate for you. The Swarovsk Ray Paperweight, by Swarovski Artist Darko Mladenovic, is being used as an award for all of Time Magazine’s 100 Most Influential People. The crystal giant Swarovski employs the most talented designers around the world working on its most popular crystal creations. Approximately 65 Swarovski artists have been employed by the company since 1976. And many times, Swarovski crystal designs were credited as ‘team’, implying that a number of people worked to the project so that a single designer could not be credited for the crystal figurine design. One designer in particular, Darko Mdadenovic, worked for Swarovski 2002 to 2008. During that time, he created 21 sculptures that were officially launched into the Daniel Swarovski Home Accessories product line of the company. His least expensive design retailed for $475 and most expensive design exceeded $5200. One of Darko’s most recognized designs was the Swarovski Large Ray Paperweight. This sculpture was a Limited Edition, with only 250 produced. The original retail price was nearly $5200. The Swarovski Ray Paperweight was almost 8″ in length, an undeniably stunning design. Time magazine recognized the timelessness and beauty of the Ray Paperweight. With some customization to add “Time 100″ as if it were a logo, Time awarded this sculpture to the recipients of the Time Magazine’s 100 World’s Most Influential People for an amazing four years! This was not just an honor to the recipients; it was an honor to Darko himself! The full article and a picture of the special Ray Paperweight sculpture can be found on the Swarovski web site. Some of this artist’s designs pictures can be found on the Darko web site . Congratulations to Darko and all the Time recipients for this prestigious title of “Time Magazine’s 100 World’s Most Influential People”. The Kristall Buzz, a Blog on Swarovski Crystal, has launched a short video on YouTube with some unusual characters cast. The characters are retired and discontinued Swarovski crystal figurines! Have a watch! The sole chick in the video is the Swarovski Mini Chicken. Introduced in 1979 and retired in 1988, the mini chicken is THE very origin of the collection which eventually lead to the popular Swarovski book publications: Warner’s Blue Ribbon Books on Swarovski. The next four loveable characters are Swarovski Happy Ducks, all of which are limited edition figurines.The Swarovski Pink Duck (with the ribbon) was a limited edition duck produced for Breast Cancer Awareness. It was only available to certain countries when it was produced in 2010. This limited edition pink duck is stamped “2010” with the Swarovski swan logo on the underside of the figurine. A portion of the proceeds were to benefit Breast Cancer Research. The Swarovski Pink Duck (without the ribbon) was a limited edition duck produced for the Kids Earth fund. When it was available in 2010, it could only be found in Japan. This limited edition pink duck is stamped “2010” with the Swarovski swan logo on the underside of the figurine. While the final 2 performers may look like Swarovski Happy Prince and Swarovski Happy Princess, they are not. These limited edition ducks are the Swarovski Royal Wedding Happy Ducks. This pair of ducks is packaged in a single blue navy box. Each duck has the Swarovski Swan logo underneath. However, on the ducks’ back, there are additional markings to signify a special event. The commemorative event was the Royal Wedding of Prince William to Kate Middleton. On the back of the Prince Royal Wedding Duck is the royal wedding date: 29 April, 2011. On the back of the Princess Royal Wedding Duck is a pair of wedding rings. Watch in the video, and you will see these special markings highlighted. These Happy Ducks were limited to a production of 3000 pairs and were only available at select Swarovski crystal retailers in the UK. All these Swarovski Limited Editions can be found on the Crystal Exchange America web site in the “Limited Edition Swarovski” category! Swarovski collectors do not need to be an official member of the Swarovski club SCS to get the latest Swarovski news. Crystal fanatics have access to the news everywhere on the internet. Fanatics can sign up on the Swarovski site for free Swarovski newsletter, which is published twice a month. The crystal brand’s newsletters may include features like new Swarovski product launches, promotions, special events, trends, and more. To have access to this news, directly from the manufacturer, collectors simply need to their email address and language preference on the Swarovski Newsletter form. Since I’m already on the mailing list for this newsletter, I did not need to subscribe again. Another official Swarovski newsletter available to fanatics is the Swarovski Beauty Newsletter. To subscribe to this newsletter, collectors need to provide first name, last name, country of residence, and email. A cell phone number is optional if a collector wishes to receive the news on the cell phone (perhaps in the form of a text message?). I believe that this Swarovski newsletter will include information on the Swarovski Aura perfume, Swarovski make up jewels, and Swarovski body cream, perfumed shower gel, and perfumed spray that are beginning to launch. There is no reference as to how frequently the Swarovski Beauty Newsletter is to be issued. I did sign up for this Swarovski Newsletter and got immediate confirmation my email address had been successfully added. Two other excellent resources for reliable (yet unofficial) news are RetiredSwarovski.com and KristallBuzz.com . RetiredSwarovski.com is an excellent venue for staying current on the list of Swarovski crystal retirements for many of the Swarovski product lines. The “Retiring Soon” page of the site will indicate the most up to date information on Swarovski figurines retiring soon. This page also contains links to the Swarovski web site so that you can conveniently order before stocks are gone. The Kristall Buzz Blog is a Swarovski Blog that I have been contributing to since October, 2010. 7 months, 145 posts, and LOTS of Swarovski crystal fanatics telling us how much they appreciate the information and enjoy reading our blog. The Kristall Buzz had many facets of information. The blog on Swarovski crystal may contain details on new releases, retirement announcements, and other exciting areas that the Swarovski brand is involved with and that collectors themselves may find interesting. It is not just about crystal figurines. It is much more and fascinating to read about. I hope that everyone will stay tuned to the Kristall Buzz, and be on the look-out for more remarkable things to come! Swarovski introduced its first line of Swarovski Disney figurines in 2005. Its first collaboration with Disney, Swarovski created the “Disney Showcase Collection” of crystal figurines. The Disney Showcase crystal collection, released in 2005, consisted of the following Disney characters: Swarovski Daisy Duck, Swarovski Donald Duck, Swarovski Goofy, Swarovski Mickey Mouse, Swarovski Minnie Mouse, and Swarovski Pluto. The next Disney collection series was for the Winnie the Pooh characters in 2007: Swarovski Eeyore, Swarovski Piglet, Swarovski Tigger, and Swarovski Winnie the Pooh. Following the Winnie the Pooh series was the Bambi group in 2008: Swarovski Bambi, Swarovski Flower (Skunk), Swarovski Friend Owl, and Swarovski Thumper. After the Bambi series, Swarovski and Disney introduced the Snow White characters in 2009: Swarovski Dwarf Bashful, Swarovski Dwarf Doc, Swarovski Dwarf Dopey, Swarovski Dwarf Grumpy, Swarovski Dwarf Happy, Swarovski Dwarf Sleepy, Swarovski Dwarf Sneezy, and Swarovski Snow White. Following the Snow White series was the Lion King group in 2010: Swarovski Mufasa, Swarovski Pumbaa, Swarovski Simba, and Swarovski Timon. Following the Lion King group is the Peter Pan series in 2011: Swarovski Peter Pan and Swarovski Tinker Bell. In addition to the Peter Pan series in 2011, Swarovski has launched the Swarovski Adventurous Pirates in their jewelry line. Some of the jewelry is worn in the Pirates of the Caribbean on Stranger Tides movie! 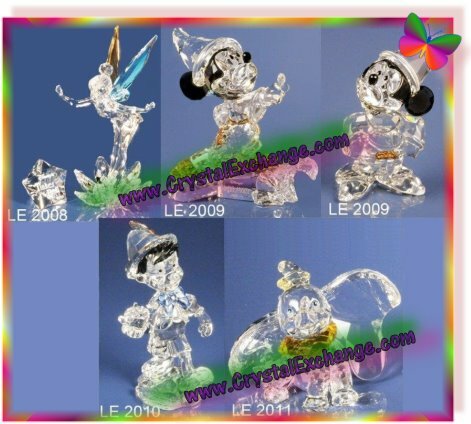 There is a web site with the crystal figurines Swarovski Disney Retirements in a free and easy-to-use format. RetiredSwarovski.com has a series of web pages with Swarovski Disney Retirements, 2008 through 2011. If you want to know what year a Swarovski Disney figurine retired, use the ‘search’ box of the site, and the results list will indicate a list of possibilities for a collector to select from to make getting the retirement year (answer) successful. At RetiredSwarovski.com, it is also possible to print out the fact sheet for all the Swarovski Disney retirements, 2008 to 2011. The fact sheets are very handy in knowing which figurines retired in which years. The fact sheets include small photos, official Swarovski Product Name, Swarovski Part Number, Swarovski System Number, Swarovski Designer, Year Introduced, and Year Retired. 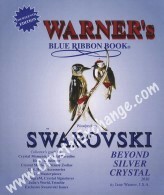 The printable fact sheets at RetiredSwarovski.com are created by the Swarovski expert authors of Warner’s Blue Ribbon Books on Swarovski. They produced books on Swarovski Crystal, and republish annually. Crystal Exchange America has a selection of Retired Swarovski Disney figurines in their online store. If there is a Swarovski Disney crystal figurine absent from your display, visit the web site now, or if it is something that they can locate for you. Most Swarovski crystal collectors already have their favorite Swarovski dealer that they go to first when there are new Swarovski crystal figurines released. Or perhaps for convenience sake, a collector always purchased their crystal on the Swarovski web site. But sometimes, there is a need to seek out a new place to purchase Swarovski figurines. Maybe you will be traveling and want to know if there is a dealer at your destination. Or possibly you want a Swarovski crystal figurine of another product line that is not carried by your favorite dealer. 3. Lastly, pick the city. These steps will assist any Swarovski collector in locating a store or boutique in the desired area. The less information entered on the Boutique Finder form, the more stores will be displayed in the search results. The boutique results contain a lot of information: Store Name and Type (Authorized Retailer or Swarovski Boutique), phone number, city, state, zip code (USA search results), small icons indicating product lines carried at that location, and some have a ‘view map’ button. If you are looking for a particular item, the “Assortments” will be of interest to you. On the Swarovski site, “Assortments” means product lines. There are nine check boxes that a collector can select, depending on what is being searched: Swarovski Jewelry, Swarovski Fashion Accessories, Swarovski Sunglasses, Swarovski Watches, Swarovski Member Products (SCS), Swarovski Fragrances-Beauty, Swarovski Figurines, Swarovski Home Accessories, and Swarovski Gift Cards. I am wondering where the new Swarovski Aura Perfume can be purchased in the USA. So for country / region, I select USA. I leave the rest of the location options blank because I don’t care where in the USA, as hopefully the store will ship to me. Under assortments, I select Fragrances-Beauty. And then I click on ‘search’. Unfortunately, the results indicate that no stores in the USA carry the new Swarovski Aura Perfume at this time. Nonetheless, I’ll check back soon to see if it becomes available. If you are a new collector, perhaps this was a web site feature you had not yet found. If you are a long-time collector, possibly this was a feature you were not familiar with. In any case, it just might be a feature that you find yourself using with some of the newer lines, like the perfume, in locating the figurines you want to add to your collection. Today I happened upon another article which had more information about the Hello Kitty and Swarovski collaboration I’ve been writing about. The article does indeed confirm that the Swarovski Hello Kitty collection will be available in select Swarovski stores beginning in August. It did not specify if the stores are Swarovski Boutiques, authorized Swarovski dealers, or a combination of both. The article elaborated on the items in the collection: necklaces, pendants, bracelets, rings, Swarovski’s ‘power bag’, and several crystal figurines. The exclusive Swarovski Limited Edition Hello Kitty was also mentioned. The Swarovski LE will be decorated with nearly 20,000 Swarovski pave stones using their signature pointiage technique. There was no mention of where this kitty will be displayed or how it will be sold. Lottery? Online order? Available to a Hello Kitty group like the Swarovski SCS? Hello Kitty seems to have a pretty big following….she’s been around for over 35 years now. Hard to imagine that a cartoonish Hello Kitty cat has survived all the cultures and changes in technology to still remain popular. I’m not saying that I like or dislike, just that many fads have ‘their time’, and Hello Kitty seems to be going strong. After learning that the Swarovski Hello Kitty line will be available in select stores, I have to think that it will be available at the online store of Swarovski.com. This Sanrio Swarovski collaboration is great news for Swarovski crystal and Hello Kitty fanatics. In my last Swarovski Hello Kitty article, I wrote about the joint venture where the 2 companies, Sanrio (Hello Kitty) and Swarovski, are producing jewelry, Swarovski crystal figurines, and a Swarovski jeweled mascot of Hello Kitty to be available later in 2011. There are about nine Swarovski Hello Kitty products mentioned along with some photos of the upcoming releases. Shortly after I completed that article on the collaboration between Sanrio and Swarovski, I found more interesting information. As it turns out, in 2009 Sanrio and Swarovski came together to produce a ‘Super Hello Kitty’ doll to commemorate 35 years of the popular feline’s success. The Super Hello Kitty jeweled doll is literally one of a kind. The Super Hello kitty was approximately 4 inches tall, and 1.25 lbs. It was decorated with over 232 carats of 2300 real gemstones….diamonds, topazes and naturally pink sapphires. The value at that time? $153,000! Swarovski Super Hello Kitty, cebrating 35 years! There is more on this Swarovski Super Hello Kitty on the Swarovski Gems web site. Their article is entitled ‘Enlightened Swarovski Elements joins Sanrio in celebrating the 35th anniversary of Hello Kitty with a one-of-a-kind, Super Hello Kitty Doll. 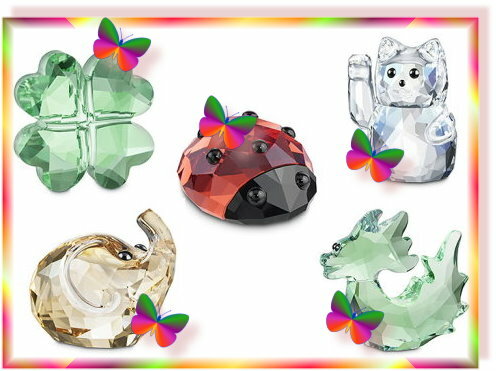 So, it looks like we’ve uncovered 2 Kitty Crystal Miriads to go along with all the ones that are presently available from the Swarovski crystal brand. 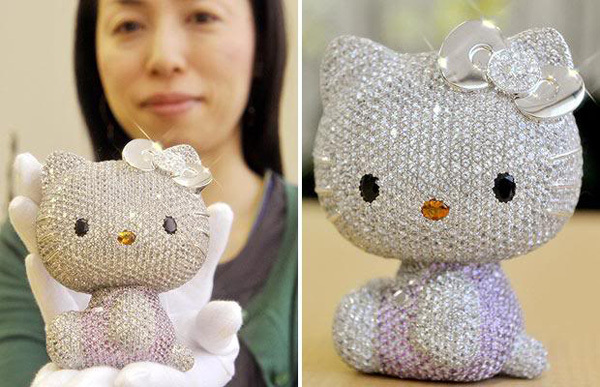 But with Super Hello Kitty being made with real gemstones, it certainly takes the cake! I recently learned that Sanrio, the maker of Hello Kitty, has collaborated with Swarovski again, to produce about 10 items in the fall/winter 2011/2012. Included in the list of items to be launched are …. To no surprise, there is a Swarovski Limited Edition 2011 Hello Kitty Mascot! There are 88 LE Swarovski Kitties decorated using the pointiage technique. The mascot has approximately 19,600 Swarovski stones. This Swarovski Hello Kitty statue will retail for approximately $12,000 USD! One source indicated that this special Swarovski Hello Kitty collection will be available in the Sanrio’s 1900 stores starting in August. They cite 7 necklaces and pendants, 3 bracelets, 2 rings, a range of leather goods and 3 figurines. I’m wondering what the packaging for the crystal figurines will look like. Will it be the traditional Swarovski box in navy? Or does Hello Kitty have their own packaging style? Will the crystal figurines bear the Swarovski logo? Or does Hello Kitty have a special mark they use for figurines? As the Swarovski stores do carry the Swarovski Disney figurines (a joint venture with Disney) and it appears they will be carrying the Swarovski Aura perfume (a joint venture with Clarins), I wonder if the Swarovski crystal Hello Kitty figurines will be there too? Swarovski has opened its first boutique onboard Germany’s TUI Cruises’ vessel Mein Schiff 2. Gebr Heinemann will own and operate this stand-alone Swarovski boutique, which is located at the Neuer Wall on deck 7 of the vessel. I would imagine this boutique will be selling an expansive line of Swarovski jewelry and Swarovski crystal figurines. According to Daniel Swarovski Corp Vice President Travel Retail spokesperson Peter Zotti, the crystal brand has plans to open its next Swarovski boutique on a well-known English cruise ship. The architecture and decor of this boutique is “Crystal Forest” concept. I found mention of other boutiques using the Crystal Forest concept, one of which is a flagship store on Oxford Street in the UK, one of Europe’s busiest shopping streets. The idea of the “Crystal Forest” is to highlight the infinite possibilities of crystal and illustrates the company’s deep affinity with nature. Being the owner of that Swarovski crystal boutique on a cruise ship sounds like a dream job to me! Superstitious? Everyone has their special little ways of ensuring continued good luck or success when all is going well. Or the quirky things people might do to ‘change their luck’ when things aren’t going as expected. Today is Friday the 13th. Some people may be staying away from black cats and avoiding of the ladders. I won’t be cleaning out my Swarovski crystal cabinet….no need to take any unnecessary risks. The Swarovski Lucky Gifts are new little crystal figurines that launched a couple months ago. They retail for $25 – $45, depending on the figurine. Be safe, be careful, be happy, and hope for a hamless and healthy day this Friday the 13th! Swarovski Crystal Books on Sale! 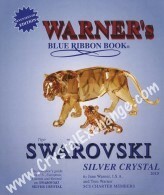 While the 2011 Swarovski Books by the Warner’s have been available for about 3 months now, some Swarovski collectors are satisfied to purchase older, like new, Swarovski books and save some money so that they can purchase more Swarovski crystal! Crystal Exchange America has some 2010 Swarovski book sets listed now on the eBay auction platform. The Swarovski book sets are in new condition and are not pre-owned. The Swarovski books are leftover inventory. Since the information in them is based on 2010 research, the Swarovski ERVs are a bit out of date. And of course any Swarovski Crystal release that occurred in 2010 will not be included in the book. The Swarovski books: Warner’s Blue Ribbon Book on Swarovski Silver Crystal and Warner’s Blue Ribbon Book: Beyond Silver Crystal for 2011 can be purchased directly from the authors at wbrb.com . Individual books start at $75 for black and white editions and $150 for color editions. As an alternative, Swarovski collectors can purchase online subscriptions to the Swarovski database by the Warner’s at wbrbonline.com . Annual subscriptions start at $40 / year. Database subscriptions do require internet access, but can be used from any computer or ipad anywhere in the world. So, any Swarovski enthusiast wanting a great book at a terrific price, should hustle on over to the eBay auction. There are a limited number of Swarovski books sets and the auction is only running for about 10 days! Have you noticed that when you place an online order at Swarovski.com that a “Surprise Gift” (Swarovski system # 1081872) is automatically added to your shopping bag? From what I can tell, there is no minimum purchase for this Swarovski Surprise Pouch, just purchase anything and the Surprise Gift will be yours! I recently placed an online order, possibly the first one since purchasing my Swarovski Black Panther, and my order and Surprise Pouch arrived this week. 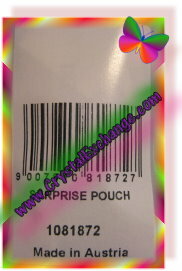 The Surprise Pouch, a small see-through bag of tiny loose multi-color Swarovski crystals, has a Swarovski label with the system number identified in the shopping bag. 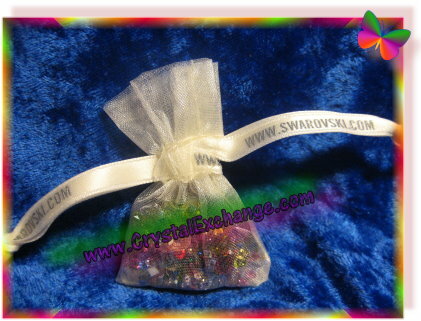 The bag of Swarovski crystal stones tied with a cream-colored ribbon, with the official Swarovski web site in gray letters. A miniature “Thank You” card is also enclosed in the Swarovski zip-lock style plastic bag. While the Swarovski Surprise Pouch may not seem like much, I do think it is a nice gesture that there are a few free offers still found in the online market today! I’m not sure how long Swarovski will be offering this free gift, so if it interests you, place an order soon!